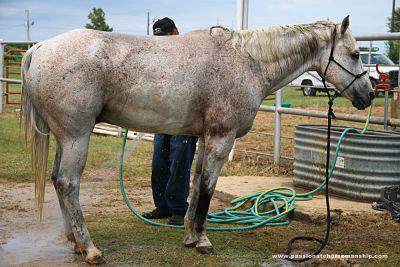 Cleaning the sheath is something that is unpleasant for the horse as well as the owner, but is necessary for your horse’s health. The purpose of cleaning the sheath is to remove the smegma, which is excess dirt and other excretions that build up inside the sheath. This should be done at least once a year. Some horses will also develop what is called a bean, which is a firm lump of smegma that hardens inside the horse’s genital area. If your horse develops a bean it’s best to remove it as soon as possible so that it doesn’t cause your horse pain. If the bean gets too big it can cause a blockage and the horse won’t be able to urinate. Before starting the process, you will want to have all the items you need such as rubber gloves, towels, bucket, cleaning products and warm water. This is not a job for the faint of heart it can be smelly and is messy. Beans are removed by inserting your little finger into the urethral and gently rolling it out. Cleaning the sheath is something you can do yourself or you can have your veterinarian perform the task. If you’ve never done either of these before get help from someone who has experience doing this or have your veterinarian do it. Be careful as some horses will kick, bite or may strike. When cleaning the sheath it’s best to have someone help you with the process so you don’t have to tie your horse up and for safety reasons. If you don’t have someone to help you hold the rope in a way that you can control the horse so you don’t get kicked. For cleaning you can use products that are sold specifically for cleaning the sheath or you can use a mild soap. Be sure to rinse the area well as you don’t want to leave any residue behind for it to cause irritation. Getting your horse to drop can be a challenge. Some of the things you can do is have them tranquilized by a veterinarian to help them relax, but some will allow you to gently grasp the genital area and pull it out. Another way this can be done is with positive reinforcement (clicker training). Letting the horse smell specific essential oils can also help them relax. A great way to learn about this process is to watch the video from Dr. Geoff Tucker, DVM performing this process. This is why I always stress the importance of being able to touch your horse everywhere before you have to do anything like this. It is not fair to the horse to rush them through the process so be gentle and take your time.